Ice cream is one of those foods that is pretty much universally loved. I mean, who doesn’t love ice cream? Certainly not my family. We absolutely adore it. When, as a baby, it was found that I was lactose intolerant, my mother lamented the fact that I could never eat ice cream. Later, when I was a little older and had – thankfully – grown out of my lactose intolerance, my sister and I would spend a week or so each summer visiting our Nana. The last thing my dad always said before our parents dropped us off was, “Sue, don’t feed them ice cream for dinner,” to which my Nana would just wave him off. Because, while my dad was half joking, he really was only half joking. My mom grew up having ice cream sundaes for dinner on Sundays during the summer, and to this day my Nana has a freezer in her basement stocked solid with ice cream. That’s right, my Nana is awesome. It wasn’t until I moved down to Washington, DC to go to college though that I ever really had frozen yogurt. Froyo, as it’s called in DC, is all the rage. There are literally froyo bars everywhere, and the fad is quickly spreading. Within the past year three frozen yogurt bars have even appeared in my small hometown. And you know what? Froyo is great. Much healthier than ice cream, frozen yogurt still has all the creamy goodness you get with the original frozen dessert. Obviously I had to make some. I chose to use Greek yogurt due to its naturally richer and creamier texture than regular yogurt. Greek yogurt also tends to have a variety of probiotics, which are good for digestion, as well as almost twice the amount of protein as peanut butter. 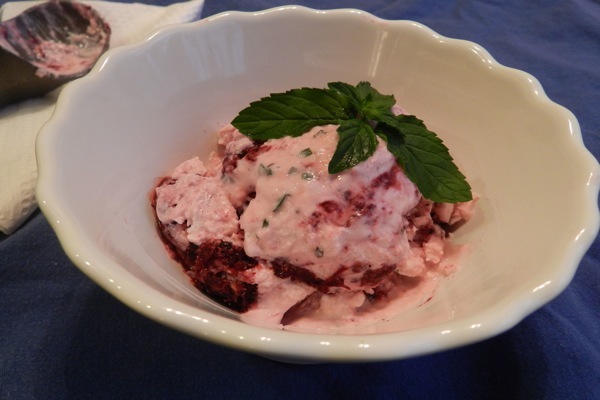 Paired with a bit of honey, blackberries and fresh mint, frozen greek yogurt turns out to rank right up there with ice cream – fresh and tasty, it’s a great way to satisfy your frozen treat craving while staying healthy. Sarah McAnaw is a senior at American University studying International Relations and biology. As serious ice cream lovers, she and her sister bought their mother an ice cream maker for Mother’s Day one year, which Sarah promptly began using to make various types of ice cream, sorbet and frozen yogurt all year round. Note: I personally like the slightly tangy flavor of the greek yogurt, so I only added a little honey for a bit of sweetness. If you have a wicked sweet tooth and want it to be sweeter, add more honey until it’s too your liking. You could always make this in single servings as well by using an individual container of yogurt with a handful of berries and healthy dollop of honey. It could be dangerous to not have enough frozen treats to go around in my house, so I opted to make a larger batch. Place the blackberries in a small bowl and add the honey and lemon zest. Mix together, slightly squishing the berries in the process. Let the mixture sit for about 10 to 15 minutes, until the berries soften a bit and have let off some of their juices. Pour the yogurt into a medium bowl and mix until it has a smooth texture. Add the berry mixture and mint to the yogurt; mix until just combined. Pour the yogurt and berry combination into a medium-large container, cover, and freeze for about 4 hours. You may want to keep an eye on it to make sure it doesn’t get frosty. If the yogurt comes out more granita/shaved ice-esque, don’t worry, let it thaw and spoon it into a bowl. As soon as it has warmed up a bit, it will regain its smooth creaminess. Enjoy with friends and family! Or eat it all by yourself. That would be just fine, too! Categories: Campus Cooking, Campus Life, Dinner Parties, Dorm and Dining Hall, Healthy Recipes, Nutrition and Health, Recipes, and Snacktime. I Don't Have Any: Cooking Skill, Kitchen Access, Money, and Space. I'm Cooking For...: Birthday, Brunch, Dinner Party, Myself, Spring Break, and Summer. Type of Food: Sweets and Vegetarian. I Don't Eat: Fat, Gluten, and Meat. Try using strawberry yoghurt instead.